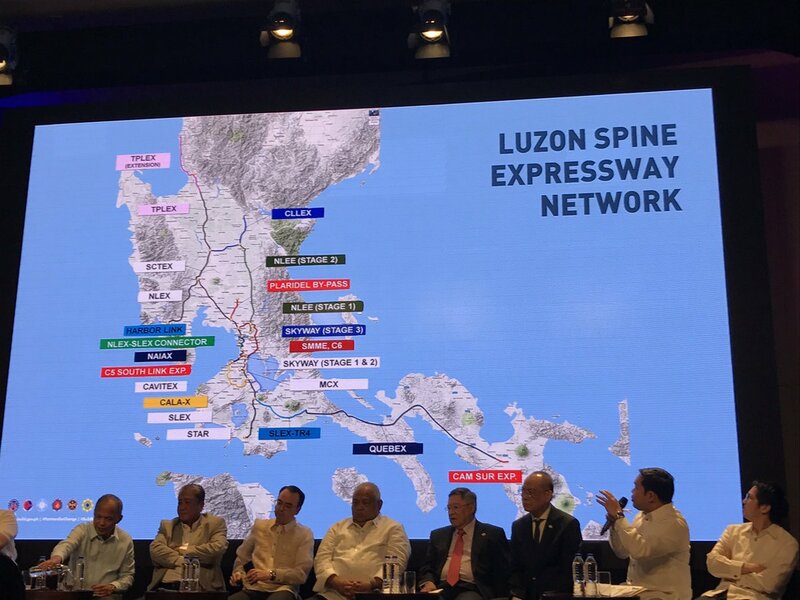 In the next six years, the Duterte Administration, will build the Luzon Spine Expressway Network — a 1,040 km expressway network which would connect the northern and southern most part of Luzon. By building a total of 18 expressways with a total road length of 655 km, Department of Public Works and Highways Secretary Mark Villar aims to compliment the existing expressway network spanning 385 km. Once completed, the travel time from Metro Manila to San Fernando, La Union will be reduced from six (6) hours and 55 minutes to three (3) hours and 10 minutes. Moreover, travel time from La Union to Bicol will be reduced from 19 hours and 40 minutes to eight (8) hours and 15 minutes. Included in the expressway network are the NLEX Harbor Link Project, Tarlac-Pangasinan-La Union Expressway, Central Luzon Link Expressway, Plaridel By-Pass Road Phase II, Metro Manila Skyway Stage 3, NLEX-SLEX Connector Road, among others. The NLEX Harbor Link Project, a 5.7 km expressway, which traverses Karuhatan in Valenzuela City, Governor Pascual Avenue in Malabon City, and C3 road in Caloocan City, will reduce travel time from Manila Port to NLEX to only 10 minutes. The Central Luzon Link Expressway (CLLEX) is a 30-km expressway, which traverses the municipalities of La Paz, Zaragosa, Aliaga, and Caalibangbangan, to connect two large cities of Tarlac and Cabanatuan. The CLLEX, which originates from the connection of SCTEx and of TPLEx in Balincanaway, Tarlac City, is expected to decongest traffic in Pan Philippine Highway by 48% and reduce travel time between Tarlac City and Cabanatuan City from 70 mins to 20 minutes. Section 3 of the Tarlac-Pangasinan-La Union Expressway is a 25.83 km expressway which extends the existing 63.02 km alignment traversing Tarlac, Rosales and Urdaneta to Binalonan, Pozzurobio and La Union — creating an 88.85 kilometer stretch. The Urdaneta-Binalonan segment which was operational since September of last year has reduced travel time from Tarlac City to Urdaneta from 2 hours and 30 minutes to about 40 minutes. Upon completion, TPLEX is expected to benefit over 100,000 vehicles per day and will cut travel time to Gerona, Paniqui, Rosales, Urdaneta, and Rosario. The NLEX-SLEX Connector Road, an 8 km four lane expressway, which will traverse C3 road in Caloocan City passing through Blumentritt and España, is expected to decongest Metro Manila traffic and provide better access to seaports and airports. It will reduce travel time from NLEX to SLEX from 2 hours to only about 20 minutes. Moreover, it will also cut travel from Clark to Calamba from 3 hours to only about 1 hour and 40 minutes. The Metro Manila Skyway Stage 3, a 14.8 km, 6-lane expressway which will connect Balintawak in Quezon City to Buendia Makati, is expected to decongest EDSA, Quezon Avenue, Araneta Avenue and Quirino Avenue by as much as 55,000 vehicles daily. Upon completion, it will reduce travel time from Buendia to Balintawak from 2 hours to 15 to 20 minutes. DPWH is now updating the High Standard Highway Network Development Masterplan which would expand the coverage from the sphere of 200 km to 300 km radius around Metro Manila.